The raccoon, this Zorro of the animal realm with a mysterious mask on his eyes, is the exact opposite of a gentleman. He is a vandal. A reckless creature that eats anything and destroys for fun. Or out of contempt. Or out of habit. Or a lack of manners. As cute as they are, as mischievous they can be. You will find raccoons in your garbage, throwing everything out like he wouldn’t care; in your garden, munching on your veggies and stomping on the ones they don’t care for; in your attic, where they sneak in, install, and declared it their home. Raccoons can throw you into the pit of despair. You’ve had enough cleaning after their mess in your yard. Enough is enough. How to get rid of raccoons naturally? 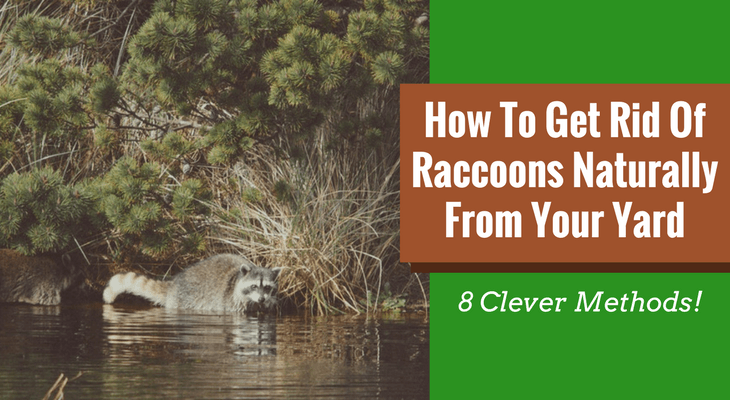 You will discover 8 harmless, natural, non-toxic, safe, and effective (well, some more effective than others) and several preventive measures to make raccoons go away from your yard and garden and never see them again. How Do You Get Rid of Raccoons in Your Yard? You want to get rid of raccoons but you don’t want to harm them. There are many methods you can try. So, let’s see how to get rid of raccoons without killing them. Seriously, you need to put the tour Eiffel on your garbage lid, so no raccoon on steroids can lift it, no matter how hard he tries and how smart he is. Because, you know, raccoons are very, very clever, persistent, and creative. Forget about that bin with loose lids. Raccoons will find a way to take it off and then savagely ravage out of the garbage and all over your yard. Since they didn’t invent garbage vaults yet, you’d better buy a strong metal or plastic bin with a thick tight-fitting lid. For extra security and safety, add a lock on the lid, a smart device that only you can unlock. If you find the above-mentioned solutions too expensive for your budget or too much for just a raccoon, put extra weight on your garbage lid, to make it impossible for raccoons to lift it, no matter how clever they might be. Or pour Ammonia on top of the lid. The smell of ammonia will repel raccoons. Since we’re talking about devices, how about a motion activated sprinkler? The sprinklers are activated when they sense movement (like a raccoon sneaking in) and they spray a mist of water (on economic mode) and make a noise that is meant to scare the raccoons away from your property. To stay on budget, you can get solar powered units. This is probably the best way to get rid of raccoons. Raccoons are great climbers. So, how can you build a fence that they can’t get over? How to make raccoons leave before they even enter your property? An electric fence (with faint electric impulses, just to scare raccoons away, not to kill them) would work, but it’s rather a complicated (and expensive) matter. You can try. It seems raccoon don’t like beech trees, as these are difficult to climb on, having a smooth surface. Are you thinking what I’m thinking? Beech fence! A tall, smooth, beech fence to stops the raccoons right at the border of your territory. PVC fences work equally well. What are you waiting for? Proceed! Note: some say that raccoons may dig underneath the fence to get on the other side if they can’t climb on it. Then, install the fence deeper in the ground. Well, chili is a great raccoon deterrent home remedy for your garden. However, keep in mind that you have to be two times more persistent than raccoons, to win the battle. And believe me, raccoons are very, very persistent. They keep trying. And trying. And trying even more. And if you don’t step back (and keep using chili to deter them from your plants), raccoons will give up and leave your property to find an easier place to get food. How to discourage raccoons to eat from your garden? Make a mixture of chili or hot pepper powder with water, then add it in a spray bottle. Spray the soil and the plants, to stop raccoons from eating them. You can also use other hot peppers like jalapenos, cayenne, etc. Cinnamon works very well, too. And you don't even need to make a concoction with it, you can spread the powder on the soil, around trees, everywhere you've seen raccoons. You get the idea. Keep in mind that these hot peppers may irritate the eyes, mouth, and skin of any other animal (think your pets) that comes in contact with it, or of your kids and family (including you). After it rains you need to reapply the hot concoction on your garden, which may be time and money consuming. Garlic is great in deterring raccoons from your garden. Why? Raccoons detest garlic. Then, sprinkle garlic powder in your garden. It’s true that your tomatoes might come on your table already seasoned and smelling like garlic, but it’s okay, since you have them on your table, and not the raccoons in their paws. Would you like eating soap? Nope. Well, neither do raccoons. Blend a handmade soap (all-natural, with no chemicals – you’re going to spray your future food with it, remember?) in a food processor with 1-2 liters of water. Then add the soapy liquid in a spray bottle and proceed to spray your plants in the garden. Note: the natural soap is a natural insecticide for many other pests in your garden. So, you shoot two birds with one soap. Epsom salt is one of the smells that raccoons don’t like, apparently. Spread Epsom salt in your garden, to protect your plants. Know that your plants will be very happy about it, as Epsom salt is beneficial for vegetables, bringing important nutrients to the soil, like magnesium. Reapply Epsom salt in your garden after it rains. That’s how to get rid of raccoons naturally. Big dogs can scare the raccoons. However, raccoons can scare small or medium dogs. So, the bigger the better in this case. Dogs can be trained to chase raccoons away from your yard. Although they will instinctively do that when they see one around. So, keeping a dog in your yard can be a natural, inexpensive, safe way to deter raccoons from your property. Never leave the garbage bin uncovered (duh!). An open bin is like an unwritten invitation to dinner for small animals like raccoons, rats, mice, or squirrels. Keep garbage bins with the lid closed and secured with weight, ropes, or locks. Raccoons have a thing for pet food. If you have pets outdoor, take their food and water bowl inside the house during the night. Harvest vegetables, as soon as ripen, pick fruits and nuts as soon as they fall on the ground. Otherwise, raccoons would be thrilled to eat these and will consider your yard a food haven. Put a mesh fence around your deck or porch to prevent raccoons from hiding underneath. Check you fences often to spot any damage or holes and be able to repair them quickly, before raccoons spot them first and take advantage of them. Don’t get near raccoons, as they may have rabies. Knowing how to get rid of raccoons naturally in your yard and garden is the only way to deter these pesky, but cute animals without harming them. I have provided many viable, effective methods that you can use fast starting right now. We have a outside cat who has a a little house. The raccoons normally just come on our patio and look for food (which we pick up every night) and then leave when they don’t find any. Now we see they are now entering our cats house now. My question is how can we get rid of them without affecting our cat?